Earlier this week, I mentioned that I was tempted to make a SWTOR alt. I'm sad/happy to announce that I have given in and rolled a new character. I decided to stay on the Republic side, so I could build up my trade skill network. The class choice turned out to be an even tougher decision. I was very tempted to make a Smuggler. It looks like a fun class with a lot of character. However, there were a couple of things working against it. One, I had already done Ord Mantell with my Trooper. Two, I have been using blasters a lot already. As a result, I rolled a Jedi Knight. 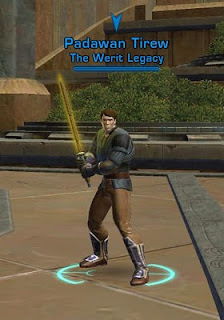 Tirew, my long time WAR character, was reborn in SWTOR. So far, I am having a lot of fun with the class. Being able to Force Leap is pretty nice, and he makes very quick work of enemies at this early level. Once he reaches level 10, I'll probably pick up Cybertech, Underworld Trading and Slicing. That way I can keep my group of characters in Armoring mods. SWTOR is having a bit of a rough week. I won't go into details, as I'm sure you know. Unlike some drama obsessed bloggers, it really doesn't bother me. I am into SWTOR for the long term, so short term issues are not much of a concern. Besides, it's just a game.